Food production kills billions of animals each year. That’s more than all other forms of animal use combined. Millions more farmed animals suffer in cruel confinement. This exclusive Faunalytics Fundamental demonstrates the scope of the problem. It also provides information to support people working toward solutions. 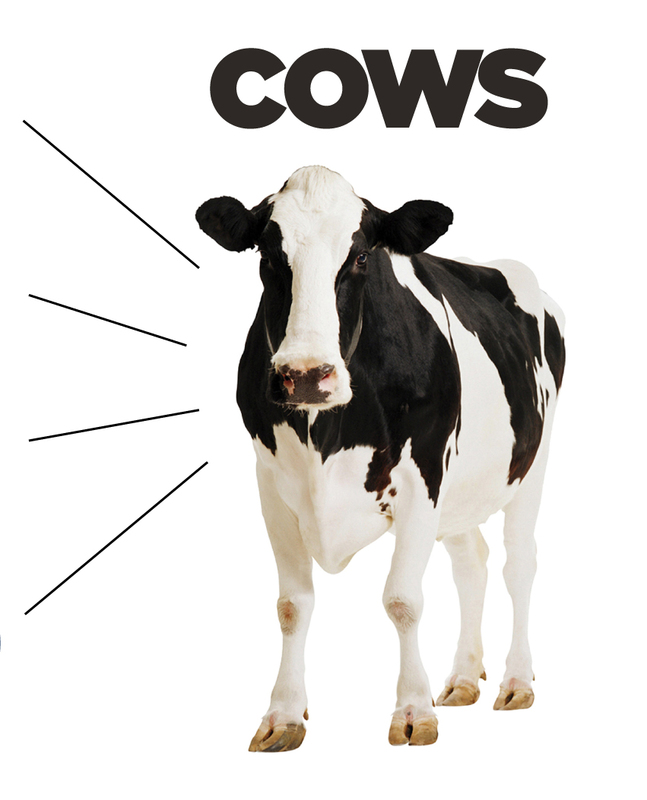 We hope you find the information useful in your advocacy for farmed animals. Please check out all of the sources here. Humans consume some amazing animals. Fishes have great memories. 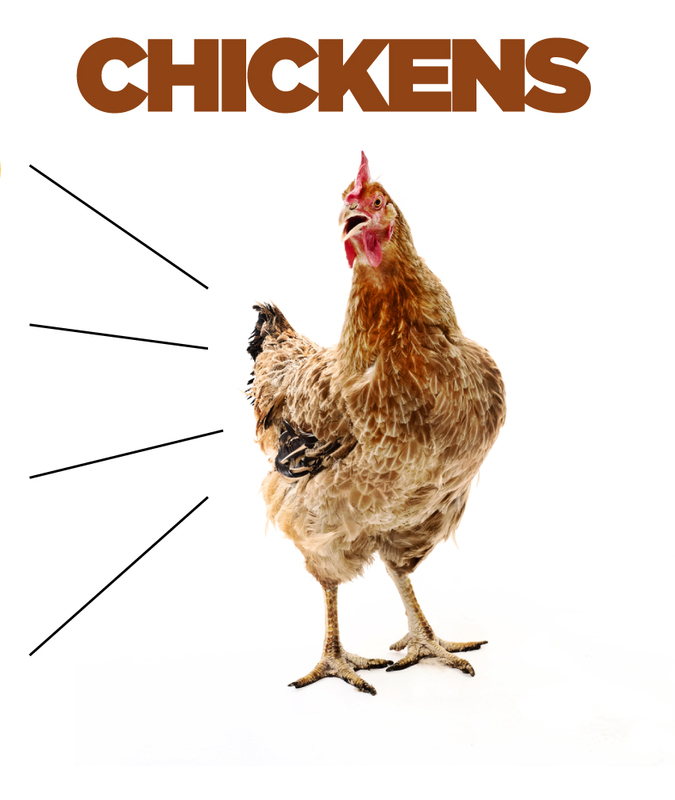 Chickens think about their future. 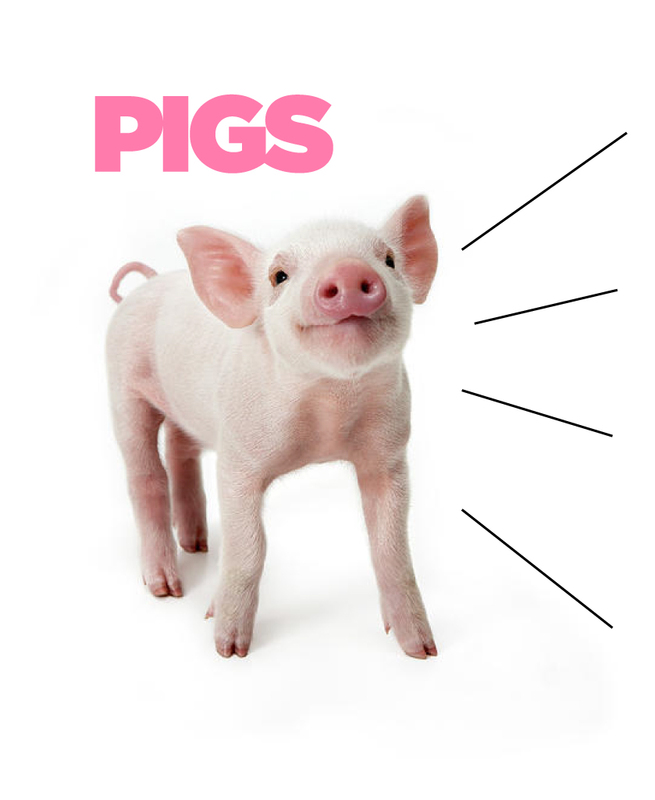 Pigs can play video games. And cows love to jump and play in the sunshine. The evidence is clear: the animals we eat are capable of thinking, feeling, and suffering just like cats, dogs, and humans. Check out the interactive graphics below to explore interesting facts about some of the animals most commonly used for food. Of course, we’re only scratching the surface of what makes these animals unique, sentient, and deserving of their own rights to life and freedom. Click or tap the icons below to explore facts about each species. While relatively few people eat a completely vegetarian or vegan diet, support is strong for protecting farmed animals. Most people continue to believe that meat is “necessary,” but most people also believe in giving farmed animals the same consideration as pets. Through our Animal Tracker, Faunalytics has been monitoring attitudes about animals used for food since 2008. Here’s what we have found. According to Gallup (2015), 54% of people in the U.S. are “very” or “somewhat” concerned with how farmed animals are treated. But what about trends over time? As you can see below, there has been little (if any) change in attitudes toward farmed animals since 2008/2009. While people’s attitudes may change slowly, however, our use of animals for food continues to grow at a rapid pace. The map above shows the global hotspots for the slaughter of animals for food (these are total figures, not per capita). The map excludes fishes and shellfishes because slaughter of those animals is not tracked accurately. Perhaps not surprisingly, China and the U.S. kill the most animals for food, but Brazil, Russia, and India are ramping up their animal farming industries as well. On a per capita basis, people in the U.S. consume far more meat than just about any other country on the planet. Above, the most recent breakdown of U.S. farmed animal slaughter may be surprising to many people. In short, we eat a lot of fishes – most of them shellfishes – as well as a lot of chickens. Sadly for these species, their small size relative to cows, pigs, and other animals means that we slaughter many more of them to produce the same amount of meat. These numbers are staggering, but they are even more shocking when you consider the waste that occurs. According to the United Nations Food and Agriculture Organization, the animals we slaughter are mostly inedible: only about 55% of the bodies of chickens and pigs are “edible” while the number is even lower for cows (40%). Farming animals is an unnecessarily cruel and inefficient process. It’s hard to imagine slaughtering an animal could ever be considered “humane.” But in a cruel twist of irony, the animals we most commonly use for food are exempt from being protected at the time of slaughter. In the U.S., for instance, chickens and fishes are exempt from the Humane Methods of Slaughter Act, which otherwise covers animals like cows, pigs, goats, and sheep. The vast majority of animals we eat have no protection from cruel slaughter practices. One of the reasons that slaughter can never been truly “humane” is that profit drives the farming industry. Corporations are always trying to be more efficient and raise and slaughter more animals with fewer resources. One consequence of this is that “line speeds” are increasing, which impacts the welfare of animals. It also hurts the slaughter plant workers, most of whom come from poor and/or marginalized communities. Before they are slaughtered for food, or when they are used to produce eggs and dairy, animals live in cramped conditions. Mother pigs who are constantly pregnant live in gestation crates where they cannot stand or turn around. Hens in caged systems are given less space than a letter-sized piece of paper, making it impossible to spread their wings. 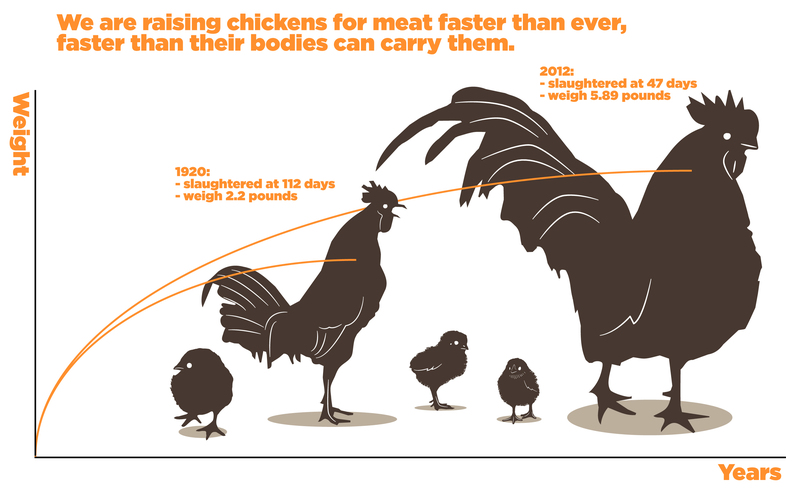 Chickens, in particular, have been bred for “efficiency” by making them grow bigger and faster, regardless of the consequences for the animals themselves. Staggering numbers of animals are bred for profit, raised in cramped and cruel conditions, and slaughtered at increasing speeds with little to no oversight. These are worrying trends for anyone who cares about animals, and everyone agrees that people have a right to know how their food is produced. Animal advocacy groups work hard using undercover video, investigative work, and other means to expose the conditions under which farmed animals are raised and killed. In the U.S., this exposure has led to a backlash from the animal farming industry. Since 2012, so-called “ag gag” have been proposed in a variety of states across the country. These laws attempt to criminalize undercover investigations of animal farming. While most of these laws have failed to pass or have been struck down, some have succeeded, hindering investigations in those states. Some people who consume animal products may think that, while factory farming exists, surely the meat they buy comes from farms that have better conditions. Unfortunately, organic, free range, and humane labels typically have little bearing on the actual conditions of a farm. 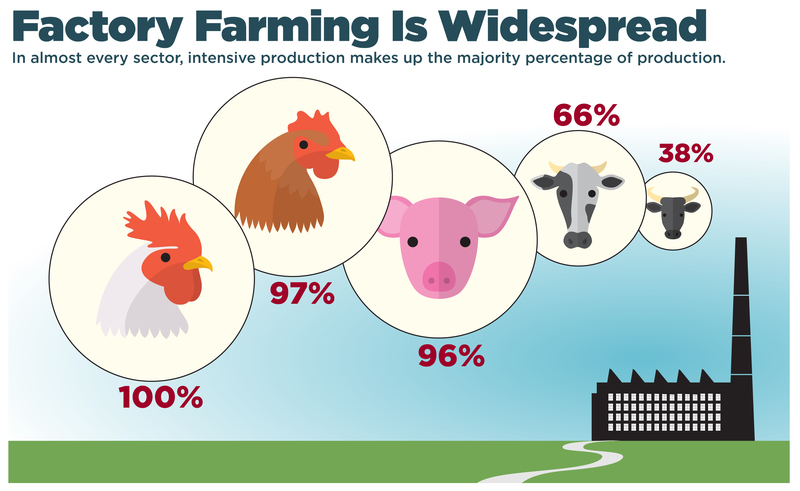 By the numbers, the vast majority of animals we consume come from factory farms. Since the publication of “Livestock’s Long Shadow” by the United Nations in 2006, the world is slowly waking up to the environmental consequences of animal farming. According to a 2015 report from the Chatham House, animal farming accounts for 15% of global greenhouse gas emissions, about the same as burning fossil fuels for transportation. Still, public awareness of this fact remains low: while 69% of people think that transportation is a major contributor to climate change, only 29% of people believe that meat production has anything to do with it. 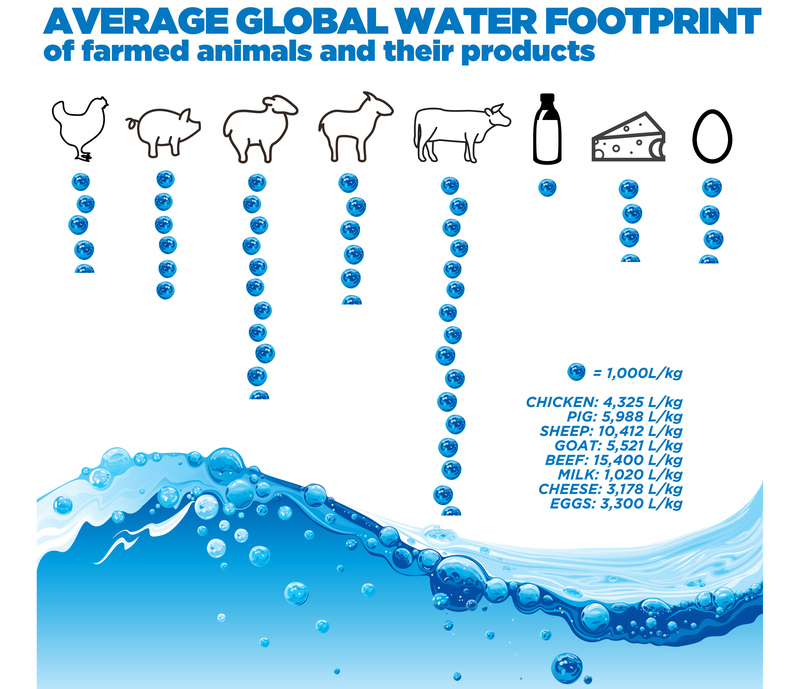 Animal farming is not just a major contributor to emissions, it is also a major consumer of the world’s increasingly scarce supply of fresh water. 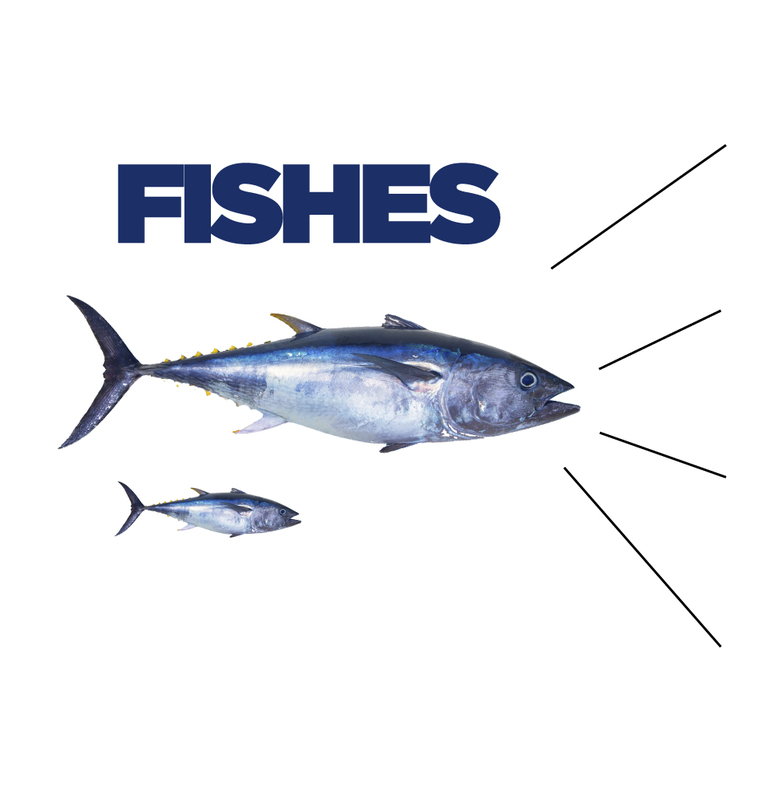 How can advocates best appeal to people regarding fish and chickens? These animals don’t engender sympathy as well as cows, pigs and sheep do. Should outreach target the 1/3 of people who already believe that eating animals is not necessary? How do these people differ from those who think they must eat animals? Why has there been little or no change in attitudes towards farmed animals since 2008-2009? Climate change is becoming a bigger topic globally. How can communications include the impact of meat production to achieve the greatest impact for animals? These questions should be topics for advocates’ consideration and for additional research. We hope you find the information useful in your advocacy for farmed animals. Check out all of the sources here. There is so much more work to be done to give advocates the insight they need to choose the most effective ways to help animals. Please donate generously now to help us bring you and other advocates this crucial information.